Magdalena: Getting back into the swing of things for the New Year wasn’t easy after such wonderful holiday season. Actually it was a touch painful. The thought of completing a 5-day work week made me cringe. What was the perfect way to recover? To forget everything with a Catskill getaway to spend some time outdoors, enjoying the snow and acting like a total, complete 5 year old. Pulling a snow tube left my upper body sore in a such a way that I’m reminded of the shape I’m (not) in. I officially entered the club of people that are obsessed with playing Cards Against Humanity. It’s proving to be pretty dangerous. Agatha: 2013, let’s do this! I managed to accomplish some pretty big things in 2012 on my list of Resolutions. This weekend (a little delayed), I wrote my big list again – the theme is ‘Upward’ – and I just find it so helpful to refer to the bigger goals and themes, as well as the short term tasks for each, throughout the year. I’m psyched about my list. One of my friends told me that I should just change when I want to change, but I mentally need some sort of a time marker to think about some improvements and reinventions…. perhaps it’s the new school year reinvention after summer from childhood that I can’t let go of and have replaced with January 1, but nonetheless, I find it helpful. And I’m not berating myself in my resolutions, quite the contrary. I stocked up on my favorite brand of chocolate (found at Chelsea Market Baskets) as a dessert instead of cookies (because let’s face it, I will never not want dessert), and I finally read my father’s favorite book, which he has been asking me to read for years, but I just hadn’t gotten around to reading. These were easier, fun things to accomplish, but my unlimited month membership at Pure Barre has not been as relaxing as those… I got sore this weekend too! But I’m finding my rhythm and for once, am loving even the tough assignments on my list. Magdalena: Why is December such a wonderful mixture of unadulterated insanity along with wonderful quality time spent with family? I love to just slowly take Christmas in if weekends allow for that instead of running around with insane people inside the mall. Online shopping had me almost completely covered this holiday season. This weekend the gray weather was perfect for spending quality time inside, drinking red wine, cooking yummy things and enjoying lots of relaxing conversation with the fam. I found that I can’t get enough of root veggies and savory flavors as we enjoyed a broth soup over roasted potatoes and sautéed mushrooms. Filling and still light enough to leave room for plenty of the aforementioned wine both as an appetizer and dessert. Pine-scented candles were lit to get that Christmas smell, the tree was sparkly, Ugg slippers were on and hot chocolate was consumed. I am SO looking forward to being a rolly polly old woman. Of course it helps that I am already half-way there. Agatha: Oh Winter, you get me. 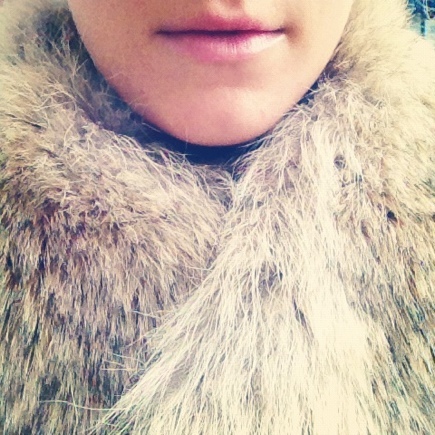 I love when it gets cold enough to wear fur. I’m (not) sorry if that offends you — I just don’t do faux. I took the coyote stole from an old coat and put it on over my new favorite cocooon coat. Add a combo of my two favorite lip products and you’re all dressed up — one is new (Revlon Just Bitten Balm Stain… this stuff is genius) and one is the oldest trick in the lip book (Aquaphor). So easy, so cozy. Then I took my furry self over to Brooklyn (ah, how things change) and had a cocktail (or two) at The Mayflower Social, headed next door for dinner at Aita and then brunched the next day at Walter’s. Damn, it was a tasty weekend. Now onto the holiday parties and cookie exchanges and pre-New Year catch-ups with friends in the week ahead. At this rate, I think I will start relaxing on Christmas Eve! Magdalena: We grew up in Upstate New York and apple picking is not an optional activity. It’s a must-do and a right of passage. The season isn’t complete without putting on comfy clothes and climbing into trees while being surrounded by bees. Pie-making is dangerous business. It’s also, other than annual camping trips, my yearly close encounter with nature in a more controlled habitat. A Saturday spent giggling while preventing Agatha from falling off of a ladder and then enjoying red wine and delicious meals was just what the doctor ordered for some inner peace. Agatha: When any season starts I feel like I revel in it and it’s my favorite season. I really think though fall is my all-time favorite season. The weather, the clothes… you’ve heard it all before. But the apples (and their sweet delicious biproducts)… now they are just the highlight. Top of the tree are usually the sweetest and prettiest apples. Climb high. My plans this week include throwing together an apple crumble, but lately, for a simple hit of seasonal apple goodness, I’ve taken to drinking heated cider with a dash of nutmeg and cinnamon. It’s the best. Just like this season. So recently we’ve gotten back into tennis. We grew up playing with our parents, but college and setting up life, etc. made us a take a little bit of hiatus. Now as official grown ups we’ve found that it’s a whole body exercise that we both enjoy and can bring ourselves to do. Dragging ones’ self to the gym: no bueno. It also is ridiculously stress relieving to whollop balls cross-court. Sometimes we’re aiming, sometimes we’re not. Angry week? No problem, play tennis. The other fantastic thing about getting back into a hobby is that you need to go and get new gear. I mean you can’t show up on the court in ragamuffin shorts and an old T-shirt. If we want to play like Maria Sharapova then maybe we also need to dress the part. There are a couple key things to remember. For starters, only the balls should bounce. Wear support. Secondly, avoid T-shirt tops that cause bad tan lines (learned this one the hard way during vacation). If you’re taking the time to tone your arms they might as well make contact with the sun. Third, this is no longer our grandmother’s prep school game with knee-length skirts, get some sun on those thighs too. Let’s just remember to stay lady-like…. always wear either a skirt or a dress. We can’t wait to see what the ladies are wearing on the court during the U.S. Open. We’re both going on Wednesday (not together, tear). Get your racket on, ladies!